Étouffante, polluée et encombrée, la ville du Caire est une parfaite illustration de ce qui attend l'Égypte d'ici 20 ans : un pays surpeuplé au bord de l'asphyxie démographique. Avec une naissance toutes les treize secondes, l'Égypte dépassera les 100 millions d'habitants d'ici trois ans. C'est à la fois une menace pour le pays et un casse-tête pour les autorités. Plus de mariages, plus de naissances, un cocktail potentiellement destructeur alors que 10% seulement du territoire égyptien est considéré comme habitable le long des côtes et du Nil. A team from the Egypt's Mummies Conservation Project has finished restoring a group of seven mummies in the El-Muzawaa necropolis in Dakhla oasis, completing the first phase of the project, Gharib Sonbol, head of Ancient Egyptian restoration projects at the Ministry of Antiquities, told Ahram Online. The restoration of Al-Muzawaa necropolis mummies came within the framework of the project, which launched three years ago by the ministry to preserve and maintain all mummies stored in Egyptian storehouses. Aymen Ashmawi, head of the Ancient Egyptian Antiquities sector at the ministry, explains that the project started with the conservation of mummies in the Mostafa Kamel gallery storehouses in Alexandria and at the Alexandria National Museum, as well as those in the Kom Ushim stores in Fayum. 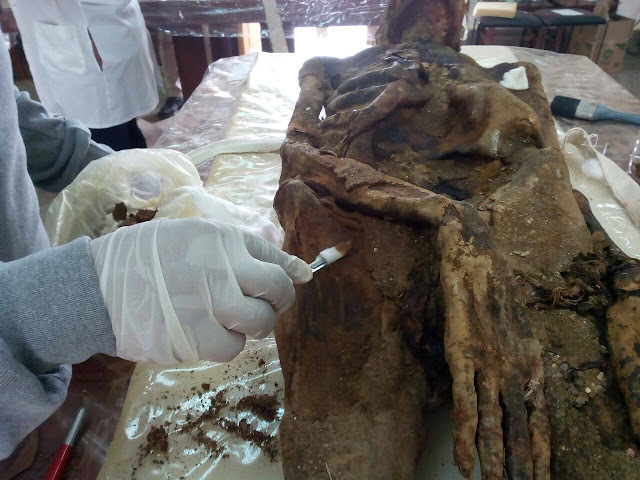 According to Sonbol, the second phase of the project will begin shortly and will involve the restoration of several more mummies. He explained that during the recently completed work, the team noted that two mummies have "screaming" faces, a term used to describe mummies with open mouths. 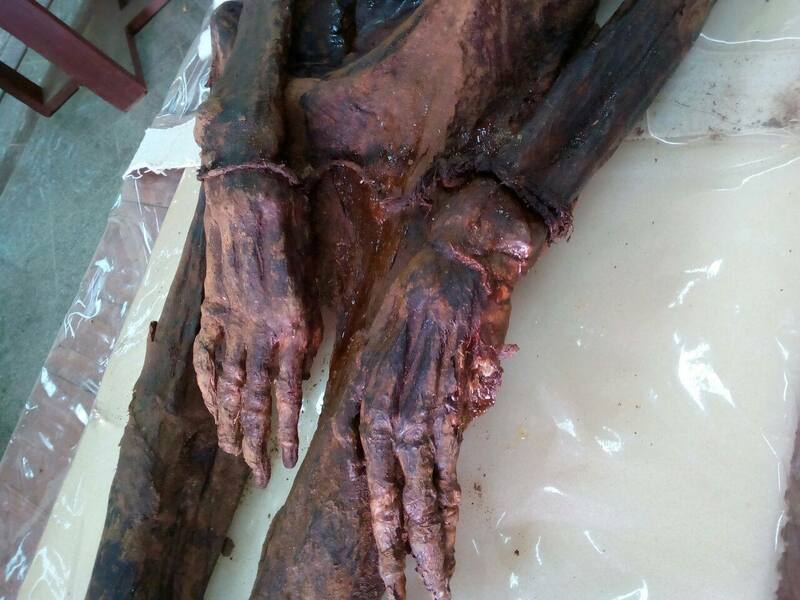 The hands of a third mummy were bound with rope. “This is not the typical form of mummification, but it indicates that those people were cursed by the god or the priests during their lifetime,” Sonbol said. He continued that the project offers a great opportunity for restorers to learn more about the death and life of those mummified people. New discovered parts of the statue of Ramses II in the Temple of Kom Ombo, Aswan – Photo courtesy of Ministry of Antiquities’ official statement. CAIRO – 28 February 2018: New parts of the statue of Ramses II were found in the Temple of Kom Ombo in Aswan Tuesday, during a project to protect the site from groundwater, according to an official statement by the Ministry of Antiquities. Ayman Ashmawy, head of the Egyptian Antiquities Department at the Ministry of Antiquities, said that the importance of this discovery lies in finding new proof of the existence and use of this temple in the modern state era. Before this discovery, the only proof was represented in Tuthmosis III, where there is a visible part in the statue that depicts King Ramses II accompanied by God Sobek and God Horus, the main gods of the Temple of Kom Ombo. Ashmawy added that the archeological team is currently working hard on the site aiming to discover the rest of the statue so that it can be re-installed as soon as possible. Mohammed Abdel Badea, head of the Central Administration of Upper Egypt, said that this part of the statue represents the king in the body of the Assyrian, where the hands are seen intersecting on the chest and holding the mark of Ankh. As for the head found in the outer back of the temple, it still retains the effects of the colors; there are remnants of red on the face and yellow on the forehead at the beginning of the crown. Abdel Moneim Saeed, director general of the Aswan and Nubia area, said that the mission had initially found the head decorated with part of its crown. Upon completion of excavation works on the site, the mission succeeded in finding the remaining part of the crown. CAIRO – 24 February 2018: The Egyptian Minister of Antiquities Khaled Anany announced Saturday the discovery of 8 tombs that contain about 40 coffins of Pharaonic priests and more than 1000 Ushabti statues in Tuna el-Gebel area in Minya Egyptian governorate. “Today we are announcing the beginning of a new discovery, the tombs are full of jewelries, potteries and pharaonic jars,’’ Anany recounted. This discovery as described by Anany is one of the largest and most important archaeological discoveries unearthed in recent times. The new archeological discovery is documenting some issues related to the live of ancient Egyptians in Minya province tens of centuries ago. The most prominent finds in these tombs were a gold mask, coffins, mummies and statues.The Egyptian ministry of Antiquities added that the area of the discovery requires years of hard work pointing out that the main advantage of this discovery is that it was discovered by Egyptians. It is worth mentioning that this discovery is considered the second discovery in 2018 after a new tomb was discovered in the Western Cemetery located in the Pyramids area in Giza to an ancient Egyptian woman named Hetpet, as announced on February 3 by Anany. Hetpet was a woman with a high social position in ancient times. She has number of cognomens from them is the Priest of the goddess Hathour. Hathour is a pharaonic goddess who symbolizes the principles of joy, feminine love, and motherhood. Anany previously elaborated that the excavation work in this area started in October 2017 and will continue in 2018 under the supervision of Mostafa el-Waziry the secretary-general of the Supreme Council of Antiquities. El-Waziry previously announced that Hetpet played important roles at that time especially in the agricultural field. “The tomb contains a group of dazzling inscriptions portraying rare amazing scenes like a monkey dancing in front of a complete musical troupe, a sailors’ fight, hunting birds, and fishing among others. 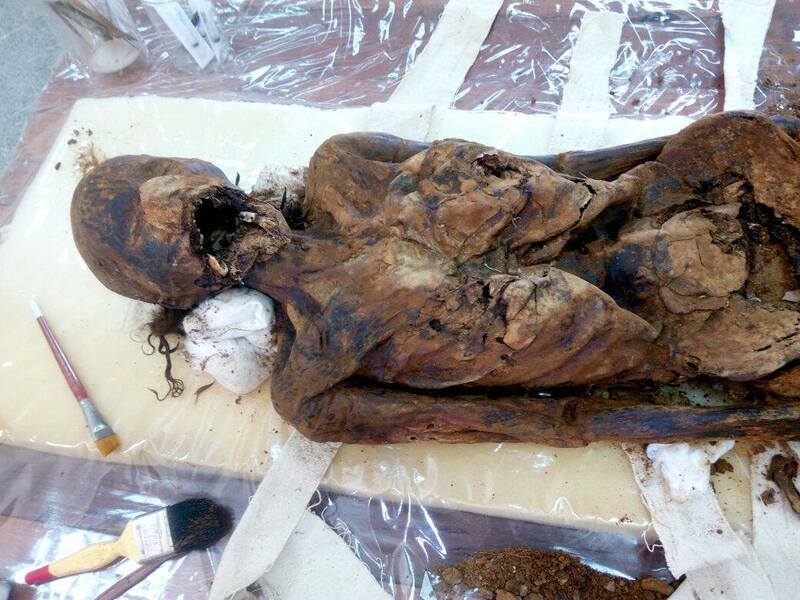 All the inscriptions colors are very clear and bright,” el-Waziry announced after the discovery. The tomb dates back to the Fifth Dynasty from about 4,400 years ago. The Western cemetery area was reserved for senior officials in the pharaonic area. The famous Egyptian archaeologist Zahi Hawass has previously discovered a group of ancient Egyptian tombs in this area. Archaeologists at Cairo University have discovered catacombs including 18 non-royal mummies in Tuna el-Gebel on Saturday May 13, 2017. The burial shafts were found in the area, adding that the shafts led to a number of corridors inside a cachette of mummies. This discovery was the first human necropolis found in central Egypt with so many mummies. Tuna el-Gebel in the city of Mallawi was the necropolis of Khmun. It contains monuments from the Greek and Roman eras, as well as the Late Middle Ages. The area hosts the Boundary Stelae of Akhenaton, catacombs of falcons, baboons and ibises, and the tombs of Petosiris and Isadora. Tuna el-Gebel village is famous for having many archaeological tombs, which contributed greatly to the revival of archaeological and touristic life, and helped drive Arab and foreign tourists to the region once again. It is an archaeological village located in Al Minya Governorate. It has a population of more than 20 thousand people. Tuna el-Gebel was originally named “Towns’’ in the Pharaonic era. It was named Tahnet in the Roman era. The meaning of both names is the blessing or flood. Tuna el-Gebel was considered a cemetery in the Pharaonic, Greek and Roman periods that contains many important monuments including the tomb and the chapel of Isadora, the martyr of love, which dates back to the Greco-Roman period. Tuna el-Gebel houses the tomb of the priest ‘’Petosiris’’ dating back to the Greek era, the villa of the Dean of Arabic literature Taha Hussein, in addition to the existence of many archaeological sites that have not been discovered yet waiting to be revealed to the world.